Looking for ideas of what to serve at a traditional Moroccan iftar or ftour, the meal offered to break the fast? The recipes here are all traditional offerings which are popular during the month of Ramadan. They typically accompany a spread of dates, hard-boiled eggs, fruit juices or milk shakes, and a soup such as harira. For variety, consider adding some dishes from the list of Moroccan Ramadan Recipes - Finger Food and Other Dishes for Breaking the Fast. Halwa Chebakia is a Moroccan sesame cookie which is folded into a flower shape, fried and then coated with honey. It's very popular in Ramadan, and is also served for special occasions. Harira is Morocco's famous lentil and tomato soup. Although eaten year round, it's especially popular in Ramadan, when many families serve it daily to break the fast. Orange flower water and cinnamon are used to flavor the almond paste filling in this easy stuffed dates recipe. If you prefer, you can replace the orange flower water with lemon zest. 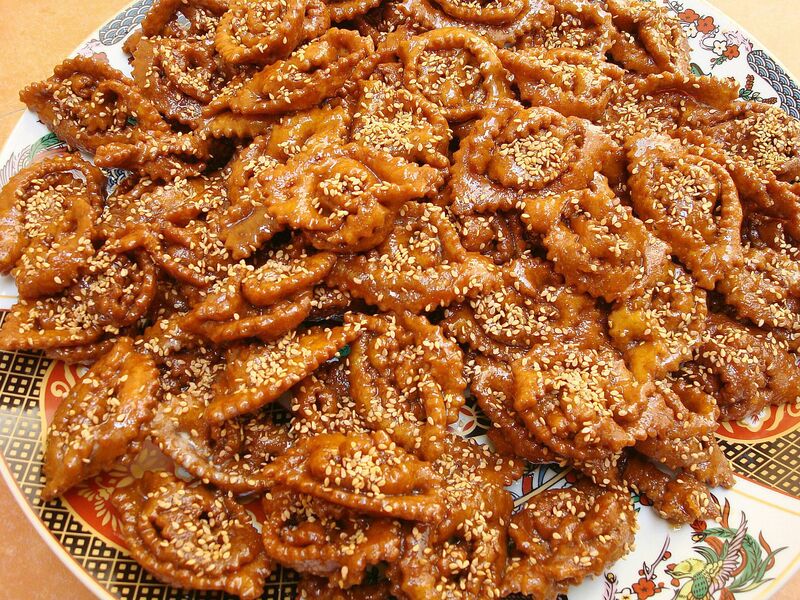 This is another special occasion sweet which is popular in Ramadan. A mild date paste is enclosed in a log of semolina dough, then cookies are sliced, fried and dipped in honey. This classic Moroccan recipe for Hssoua Belboula combines barley grits with milk to yield a rich, creamy soup that's both nutritious and satisfying. Serve it for iftar or suhoor. This simple Moroccan soup is easy to prepare and can be served in the evening or for breakfast. Although it's delicious as-is, honey is offered on the side for sweetening the soup. Sellou is a unique Moroccan sweet made from toasted sesames, fried almonds, and flour that has been browned in the oven. It is traditionally served in Ramadan and for special occasions. These popular Moroccan cookies are made by folding almond paste flavored with orange flower water and cinnamon within warqa dough. The pastries are fried and then soaked briefly in honey. Almond Briouats are commonly served at both special occasions and casual tea times. This simple but incredibly tasty version of briouats features a melt-in-your-mouth cream cheese and spinach filling. Herbs or hot peppers can be added for more flavor, but my family loves them plain. Mint tea is incredibly popular throughout Morocco. Many Moroccans consider it a must after a day of fasting. Almond milkshakes are served frequently in Morocco, particularly in Ramadan. A tiny bit of orange flower water gives this almond shake its classic taste. Nutritious, refreshing and filling, this shake is sure to satisfy after a day of fasting. It's also quick and easy to make – just five minutes from start to finish. This a Moroccan version of the popular Middle Eastern juice known as qamar el-deen. Turn it into a smoothie with the optional addition of yogurt. Msemen – also known as rghaif – are made from a bread-like dough. Portions of dough are flattened and folded into a square before being fried in a pan. They're frequently served with butter and honey. Meloui is another type of rghaif. It's made from a dough that uses half white flour and half semolina. Strips of folded dough are rolled up like ​a rug before being flattened in a circle. They can be served plain or with butter and honey. This recipe makes a slightly zesty ground beef (kefta) filling for msemen. You might like them fried, but stuffed msemen can also be baked. These sweet rolls are flavored with anise, sesame, and orange flower water. Serve them at iftar to break the fast, or at suhoor, the early morning meal eaten before sunrise. Beghrir are tender pancakes that melt in your mouth. They're made from fine semolina and are usually served with a syrup made from butter and honey. Harcha (or harsha) is a Moroccan pan-fried bread made from semolina flour. Although it looks a bit like an English muffin, it's more like cornbread in texture and taste. They're best served warm with jam, cheese or syrup made from melted butter and honey. These fried pastries feature a traditional kefta (ground meat) filling seasoned with paprika, cumin, and parsley. The addition of cinnamon is optional. Savory chicken cooked with saffron, ginger, and cinnamon makes a delicious filling for this crispy fried pastry. Batbout (also called mkhamer or toghrift or matlou') is one of my family's favorite Moroccan breads. The stove-top method of cooking yields a soft and chewy bread with a pita-like pocket. Serve it along with a variety of sandwich fillers. This Moroccan stuffed bread features a traditional filling of onions, parsley, spices and beef or lamb suet (chehma in Arabic). Pan-fried like batbout, khobz chehma is a delicious offering at tea time or iftar in Ramadan. Even Morocco has a version of beignets, a French term adopted by many cultures to refer to sweet, yeast-risen fried dough. Serve them plain, or offer jam on the side as an optional filling. Moroccan brochettes and grilled meats are excellent additions to an iftar table, particularly if the meal will double as dinner. Shown here are turkey or chicken breast brochettes. This Moroccan Lemon Cake is light, fine-textured and flavorful, perfect when looking for an easy sweet to serve when breaking the fast. Also, try the equally easy and delicious orange cake. Quick and easy to make, this juice can be served anytime, but in Morocco, it's particularly refreshing after a day of fasting during the month of Ramadan. Use fresh or frozen bananas, and freshly squeezed or store bought orange juice.